Melanie, a faithful FWWL reader, asked about saving for both Long Term and Short Term goals at the same time. Haven't we all been there? If you sit down and think of all the things you really should/want to save money for, it will probably be a mighty long list. Where do you start? Most people don't have the personal discipline to prioritize their wants and needs, so they just buy everything on credit the moment they want it and soon find themselves in deep financial trouble. There is a better way and it works every time. First -- Write your list. Take a couple of days or weeks to work on it, as it often takes some time for all your past ideas to come to the surface. Take this time to decide what you REALLY want and need. Second -- Divide your list into both Long Term and Short Term financial goals. A new car paid for with cash. Some of these long term goals aren't that exciting, but they will bring stability and safety to your future financial life. Definitely worth the effort. Remember financial goals are about both wants AND needs. Third -- Now comes the hard part. Prioritize your Long Term Goals. 1, 2, 3. . . Same with your Short Term Goals. You will quickly see that you cannot possibly save toward all of these at the same time, unless you have a great deal of extra money sitting around. My husband refers to this as trying to "ride your horse off in all directions at once." (He's said this to me many times over the years). If you try to spread your savings money too thinly, you will make very little progress on anything and will quickly get discouraged. I suggest that you choose #1 from your Long Term list and #1 from your Short Term list and save for only those two. Decide how much money each of these goals needs to bring them to fruition. Then look to see how much money you can reasonably put toward each goal every month. Make yourself a chart (I LOVE CHARTS!) with completion dates. Tape the charts up somewhere you'll see them every day, so that you will keep these goals in the front of your mind. Take it from someone who has saved for dozens and dozens of things over the years -- the first few months of saving pass very, very slowly. But before you know it, it's been 6 months and your saved $ amounts begin to look pretty substantial. Those big numbers are highly motivating to keep moving forward! I've been saving up for a set of custom doors leading from my dining room to my kitchen for quite some time and just passed the $5,000 mark (these are expensive doors) and it feels GOOD. I'm ordering them soon! The Short Term Goal will probably max out within only a few months and you can go buy whatever fabulous thing it was you wanted to get -- with cash! Celebrate not only by making your purchase, but also write across your chart in big red marker "SUCCESS!" and begin wallpapering your bathroom with these as you achieve each one OR fold up the chart and place it in your journal for future motivation. Then move onto Short Term Goal #2. You may find that some of your short term goals (possibly items #4 and below) begin to look a lot less interesting as time goes on. You'll be glad you didn't impulsively buy these items on credit and now 18 months later you're still paying for things that aren't important to you anymore. Delaying a purchase often causes your rational thinking to take control again or for you to simply change your mind. The VISA people hate that. Your Long Term Goal may take you a few years to accomplish, but you'll get there too! It may seem like a slow process at times, but there is absolutely no other way to achieve your long term financial goals. This is where you see the value of keeping your monthly fixed expenses low. The more expensive your daily life is, the harder it is to save for your future or any extra lovely things. By following this technique you will join that rare breed of people who save money to protect their futures and pay cash when they buy something substantial! Let me be the first to say it, "YOU are amazing!" Labels: Becoming Frugal, Budgeting, Buying a Car, Housing, Living on Less, Saving, Travel, Unnecessary Expenses, Why Be Frugal? Well said! We're close to the end of our top-priority long-term savings goal - paying off our student loans. It's already starting to feel great. There have been so many things that we almost bought somewhat spontaneously, without planning an d savings. And just about everyone of them we later decided we didn't want after all. I'm glad we decided when we got married to never make a big purchase without sleeping on it first. I love you guys and your blog! 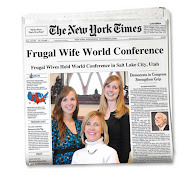 I am too a frugal wife leading to a wealthy life. We save for 1 long term goal and we allow two short term goals. We are continually saving for vacation because in our family "family vacations" are a priority and we are not going to put them on our nonexistant credit cards. Thank you for you inspiration and support. It's a good thing I married my husband, because while I'm am fairly frugal, I can be an impulse buyer sometimes. He is pretty set on not spending money we didn't budget for that month. Sometimes it drives me nuts to have to wait the two or three weeks until the next month (when we can budget for it), but mostly it helps us really think about where we spend our money. Which makes all the difference in budgeting. I love the idea of having one long term and one short term goal at time. This is a great idea. I like it and am going to sit down with my husband this weekend and make a list. I'm excited.